Condo ‘s own history reflects the variety of his music interests. Raised in the Ottawa, Ontario area, he credits his mother’s record collection (“Hank Williams, Hank Snow, Jim Reeves”) and the Grand Ol’ Opry radio broadcasts for country influences. But he also witnessed Elvis’ milestone performances on the Ed Sullivan Show. Another rockabilly pioneer also exacted influence in his region. “Ronnie Hawkins was very popular in Southern Ontario when he moved there in the late ‘50s and early ‘60s,” Condo said. Hawkins ’ backing group, the Hawks, later evolved into rock legends The Band. 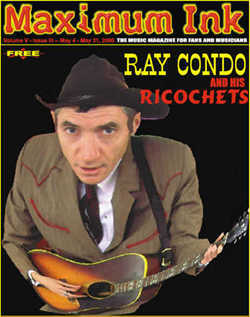 Condo’s Vancouver-based Ricochets are an esteemed mix of Canadian and British musicians, each of whom brings varied experience and passion to the group. “Jimmy Roy is a steel wizard - he’s been playing country even longer than I have. (Guitarist) Stephen Nikleva is our maestro, and has a jazz background. (Bassist) Pete Turland came from a rock & roll and blues background, as did Steve Taylor - in his teens he worked as a drummer in strip joints, so he brings that greasy club thing. And I’ve got that Ottawa Valley Celtic twang,” he quipped.